In the aftermath of a disaster, aid organisations need to very quickly identify worst-hit areas to assess infrastructure damage and ascertain the urgency of the situation. This allows aid to be properly distributed and response efforts to be prioritised according to need. The fastest way to get an overview of the scale of a crisis is by air, and footage from unmanned aerial vehicles (UAVs) is often crucial for early assessment of disaster zones. UAVs fly over affected areas and record video images, which are uploaded to the internet. Once online they can be studied and crisis zones pinpointed. But this is time consuming and nothing is more crucial at this stage in a crisis than timing. MicroMappers uses the collective eyes of a community of ‘digital humanitarians’ to do the job of inspecting and reporting on the images. MicroMappers’ volunteers trawl through the aerial images, highlighting areas of damage. When numerous volunteers tag the same area it is flagged up on the map as an area of high priority and humanitarian organisations on the ground are alerted. Tweets and photographs on social media are also examined and categorised, so that location-based information can be added to a crisis map for a full picture of the extent of the damage. MicroMappers is a joint initiative with the United Nations, and although still in development, it has already been used in practice. In the aftermath of the Nepal earthquake, more than 2,100 volunteers clicked through more than 60,000 images and tweets, resulting in over 500 relevant disaster pictures and crisis tweets being displayed on the live crisis maps. MicroMappers relies on volunteers to make its work possible. Join them at clickers.micromappers.org and become a digital humanitarian. 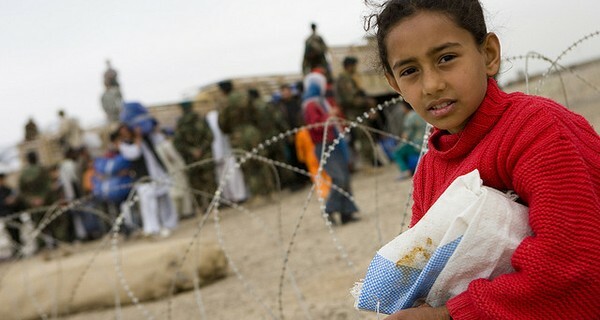 Image 'Humanitarian Aid' courtesy of ResoluteSupportMedia.